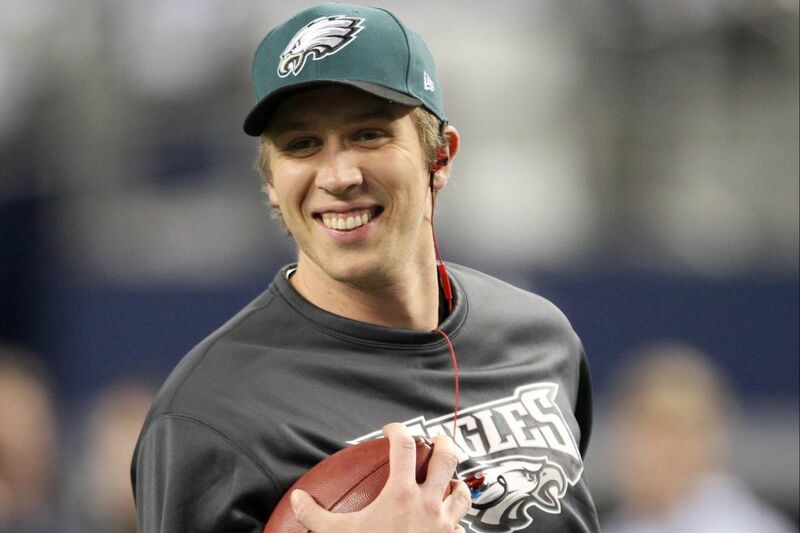 Eagles’ quarterback Nick Foles smiles while running with the football during warm-ups before the Eagles play the Dallas Cowboys on Sunday, December 29, 2013. The original plan, Doug Pederson told us more than once over the past few weeks, was to run the Eagles' offense the same way with Nick Foles as he ran it with Carson Wentz. The last couple of games have changed that plan. In going 23 for 49 for 202 yards, one touchdown and two interceptions against the Raiders and Cowboys, his longest completion 25 yards to tight end Zach Ertz, Foles has provided strong evidence that he can't make many of the plays Wentz made. Pederson was asked Tuesday about trying more quick passes for Foles, who has really seemed to struggle with pass-rush pressure, and with getting the ball out in rhythm. "I've gone back and watched a lot of his tape here, [from 2015 when he was in] St. Louis, and when he was here before, when I was here," Pederson said. "I just wanted to go back and just see the types of plays. As you mentioned, the quick throw was there, a little play-action pass, the shotgun stuff. "Those are all things that are in our system. We might just have to dust a few more off and get that ready to go. But that's kind of what this [bye] week is for: to get some of those ideas and thoughts down on paper and execute them this week in practice." Pederson said he would consider more tempo, a weapon Chip Kelly, of course, used to great effect with Foles in 2013 (and to diminished effect the next year). Pederson confirmed that Foles is the playoff starter but did not say he absolutely would stick with Foles through four quarters if he continues to be ineffective. Pederson said he watched the 2013 Eagles' 26-24 wild-card playoff loss to visiting New Orleans on Tuesday morning. That game is significant in that it is Foles' only playoff action, and that if the Saints win at home this weekend against a Carolina team they already have beaten twice, New Orleans probably will be the Eagles' divisional-round opponent. Asked what watching that tape showed him, Pederson said: "I saw a team that got down early in that game. In the third quarter, I think it was 20-7 at one point. Nick brought them back. Actually hit Zach Ertz for the go-ahead touchdown at 24-23, I believe. And then, of course, I was watching the offense. I'm assuming [Saints QB] Drew [Brees] went down and did his deal at the end." Instead, the Saints pounded the ball down to the Eagles' 14 to set up a 32-yard field goal on the final play, and that was that. But what did Pederson really see when he watched Foles against New Orleans, at the end of that magical 27-touchdown, two-interception season? The stat line was solid: 23 for 33, 195 yards, two touchdowns, no picks, a 105.0 passer rating that was better that day than Brees' pedestrian 75.7, Brees suffering two first-half interceptions. But rewatching, maybe with perceptions colored by Foles' struggles since 2013, it wasn't that great a performance. The first thing that stuck out was that New Orleans went with a three-man rush most of the way and Foles had one of the cleanest pockets in recorded history. He just stood back there. And stood. And stood. Jason Peters, Evan Mathis, Jason Kelce, Todd Herremans and rookie Lane Johnson were an excellent offensive line, even better than the group the Eagles will field in the postseason this year, a group that will send Brandon Brooks and Johnson to the Pro Bowl, and should send first-alternate Kelce. Almost all of Foles' completions came underneath, mixed in with an occasional deep seam to a tight end. At halftime, NBC showed a clip of an exasperated DeSean Jackson running free and not getting the ball on a go pattern. Jackson had no catches in the first half, which ended with the Eagles ahead, 7-6. After Keenan Lewis, who was covering Jackson, left the game with a suspected concussion, Foles hit Jackson down the sideline for 40 yards, setting up the LeSean McCoy TD run that brought the Eagles within 20-14 near the end of the third quarter. Both sacks of Foles were coverage sacks; the first was just inexcusable, leaving Henery with a 48-yard field-goal attempt that he missed, after the Eagles had a first down at the New Orleans 15. A 10-yard touchdown pass to Riley Cooper – who also dropped a huge gainer – was clocked at 7.14 seconds from snap to catch by NBC, which is an extraordinary amount of time, in the red zone. It seemed every blitz New Orleans defensive coordinator Rob Ryan called gave Foles trouble – including a panicky intentional grounding – but for some reason, Ryan rarely blitzed. "I saw a guy that stood in there, took some shots in that game, delivered some great throws in that game and led the team back to at least the go-ahead touchdown late in the game," said Pederson, who had followed Andy Reid to Kansas City and was occupied that day watching the Chiefs blow a 41-24 lead with 4:12 left in a 45-44 wild-card loss to the Colts. "That's the type of quarterback that we have." Well, yeah. If you wall him off from the pass rush, and have LeSean McCoy, or a reasonable facsimile, on hand to pick up the tough yards. We'll see how that goes.